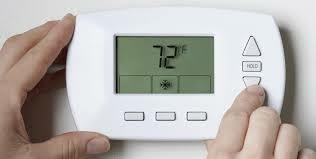 Programmable thermostats truly are the ultimate in convenience. Today most of them can be programmed to turn on and off at the precise times that you want multiple times a day. You can control the exact temperature while no one is home to greatly reduce energy costs but always come home to the perfect climate controlled environment. Here’s an example of what you can do with a modern thermostat. Let’s assume that your normal weekly schedule is going to bed at 11 and waking up at 7 to prepare for the work day. You leave for work at 8:30 and arrive home at 6:00 in the evening. You could set your heating or air conditioning to a lower setting at night until 6:45 in the morning, 15 minutes before you awake to start the day. That way by the time you’re headed for your morning shower you’re in the “Goldilocks Zone”, the temperature is “just right”! The system can again lower it’s settings for your 8:30 departure and remain at the lower setting until 15-30 minutes before you arrive home from the daily grind. Some thermostats available today can actually do much more than this simple routine including the ability to control it from a telephone but you get the idea. You can literally save hundreds or even thousands of dollars a year on energy costs by installing this very reasonably priced gadget. It is one investment in your home that will always pay off in the long run. If you decide the time has come to upgrade your thermostat you can easily do it yourself and it takes very little time. Here’s what you need to know. The only tools you will need are a couple of screwdrivers, a level and a drill and drill bit. First we need to remove your existing thermostat. 1. Make sure the power is turned off at the circuit breaker/fuse box and then remove the thermostat cover. 2. Remove the wires from the thermostat and be sure to label each wire (most new thermostats provide stickers for this purpose) as you go. 3. Remove the body of the thermostat from the wall and DON”T ALLOW THE WIRES TO FALL INTO THE WALL! Spread them out so that they don’t accidentally go into the hole. Pretty simple, right? Now we will install our new programmable thermostat! 1. Remove the base from the new thermostat and place it over the spot where the old thermostat used to be. You might want to use your level at this point to be sure that your new thermostat isn’t “crooked” when you’re done. 2. Use the base of the new thermostat as a template to mark the exact locations on the wall where you will need to screw it in. A pen, marker or even a screwdriver will do. 3. Now simply drill holes for the screws where you marked the wall. Make sure you use the proper size drill bit; holes that are bigger than the screw don’t usually work very well! 4. Here’s a trick worth knowing: Fill the holes around the wire with paper towels to help avoid drafty air from entering the thermostat. Believe it or not this could actually affect the accuracy of the thermostat. Some new thermostats come with a special material for this very purpose but if yours didn’t, paper towels will work pretty well. Pull the wires through the hole in the back of the base and screw the base onto the wall. If you have drywall be sure to use the drywall anchors that were included with the new kit. This will ensure that your new thermostat is solidly mounted. 5. Using the labels that you attached to the wires when removing the old unit, connect the wires to the new thermostat. Be sure to follow the wiring instructions on the new unit. 6. Now attach the new unit to the base and you’re done! Be sure to read the programming instructions for your new programmable thermostat so that you can get fully understand its features. Now it’s time to start saving money!